We at Jupiter work with businesses that need high visibility for their websites. By combining industry-leading Search Engine Optimization (SEO) techniques, pay-per-click campaigns and link building, we get your website seen on the search engines. Because we are good at getting high rankings for our clients, they have been successful in attracting more qualified traffic to their sites. And, with more qualified traffic, they’ve experienced increased leads and sales and, real business growth. Much can be said about good Search Engine Optimization (SEO) in terms of getting your site on search engines, but it actually doesn’t require a lot of work for you to make certain things happen that are favorable for Search Engine Optimization (SEO). Search engines like Google, Bing, and Yahoo like sites that have content that is constantly changing, coded properly, and isn’t heavily based on images. While you can often help by keeping your site updated yourself, things like making sure the site is coded properly may need to be investigated by a web developer with Search Engine Optimization (SEO) experience who can look to see if there are any coding elements that could be causing problems for you where it comes to search engine optimization. Our selection of Search Engine Optimization (SEO) packages has been carefully designed so that each client with our expert guidance can choose an approach that perfectly suits the scope of their budget and the online habits of their target demographic. From extensive keyword analysis and research, to sitemap building, content writing, press releases, full site optimization, and much more, all of our specialized techniques are geared toward dramatically improving your website’s ranking on all the major search engines. Also, over the years we have refined existing methods and developed unique proprietary technology found nowhere else. What distinguishes our search engine optimization company from the competition? First and foremost, we strongly believe in tailoring all of our Internet marketing services, including our social engine optimization services, to the particular needs of each client. We first examine your business priorities, the current state of your website’s SEO, and the current state of your competition. We then design and execute a carefully crafted SEO strategy to turn your online presence into a marketing tool that draws more visitors, and this more revenue, to your business. SMO stands for Social Media Optimization, a methodology in field of Online Marketing. The web presence and popularity of any kind of services, products, business increases with the activities in the social media websites, such Facebook, Twitter, LinkedIn, Blogspot and others.The website existence depends upon traffic for which the inclusive effort of all the internet marketing methods are responsible. SMO stands for Social Media Optimization, a methodology in field of Online Marketing. The web presence and popularity of any kind of services, products , business increases with the activities in the social media websites, such Facebook, Twitter, LinkedIn, Blogspot and others. The website existence depends upon traffic for which the inclusive effort of all the internet marketing methods are responsible. Today social networking has become a part of our life, thanks to the internet medium. Social networking on internet has allowed users to connect with other people on a global level. Thus, it has become a powerful platform which no organization, big or small can neglect. Online competition between organizations is growing by day and night. Social networking platforms offer online businesses a chance to stay ahead of their competition by increasing their brand image and user base. Social networking sites are not only one of the most frequently visited sites, but they are also highly trusted sources of information which has the power to influence user behaviour in a similar way like word-of-mouth advertising. Now we all know what word-of-mouth advertising is capable of. Add viral marketing and speed of internet to it and voila you have got a perfect marketing campaign, that too at very less cost to your organization. Social networking sites have a large user base, for example, Facebook has more than 700 million users worldwide. Ignoring social media means taking a risk of losing, a significant amount of your visitors, prospective customers and thus business. Jupiter offers comprehensive Social Media Optimization (SMO) services to give you maximum benefits such as branding, targeted traffic and a larger footprint online, out of your social media investments. Jupiter utilizes popular social networking platforms like YouTube, Facebook, Twitter, Linked-In, Flickr and blogs and many more to deliver the best of social media to you. Social Media Optimization (SMO) is a wonderful part to play, to engage the wide spread consumer base through the online mediums such as facebook page of the product. The major target audience believe in "What they see", "Ask inquiries" & "put trust", which majorly is done through the visibility, branding and increasing the mediums of approach. Why Jupiter for Social Media Optimization (SMO)? Jupiter is one of the leading company in Social Media Optimization (SMO) market with an aim of becoming the best in India. Jupiter bridges the gap between the target audiences and their end products. Through comprehensive understanding of the social media aspects, formulates Social Media Optimization (SMO) services plans. Our social experts understands the products, services, their branding and relevant contents driving the social media marketing. We work with close interactions with the marketing experts of the respective products/services to monitor their successes and difficulties in hitting the target base. To influence and gain trust with the visibility created by us is the best amongst the Social Media Optimization (SMO) company in India. We create blogs/content in top ranking pages, which are blogspot, wordpress. Social Media is to enhance the connectivity in each and every step through mind boggling contest, write-ups about products and their usages, about various services and their effects, which Jupiter provides the best with their creative teams. Create Social Media Pages : All the major social media platforms, facebook, twitter, LinkedIn and others to enhance visibility. This is the age of virtual marketing. Owing to this fact, almost every company has a website that internet users can access. But just having a website is not good enough. The businesses need to make sure that their website gets proper visibility and hence they engage in methods that will make the website more popular. When internet surfers search for items and information that a company provides, the company would want its name to come up on the first list of the search engine. For that reason alone, they resort to SEO services India. Search Engine Optimization gives internet exposure to a brand or a product by making it visible to a varied base of viewers. Even if a viewer is not a potential client, they may like the website or the product and talk about it to those who are interested in it. When more and more people get to know about a product or a brand through search engine optimization in India and in other countries, it increases the sales and boosts the company profits. Search Engine Optimization (SEO) is a very affordable medium of promoting a product and hence is used by one and all. There are very few performance based SEO companies in India like us that offer guaranteed search engine rankings and website maximum visibility guarantee. As best SEO company India, we know the SEO market quite well and hence our services are quite different and streamlined so we can produce the best results. The services cover a large ground. We monitor the website indexing, keyword position, engine rankings as used by regular net users and utilize them to promote your company and product. Since On-page SEO, Off-page SEO and link building also helps to get a lot of business, we engage in it as well. Our project management is effective and helps you to keep a tab of the business growth. Our daily technical audit helps to identify any technical fault and eradicate the same. We provide a competitive analysis of similar websites to understand your rank. With so many business benefits in search engine optimization, SEO/SEM seems to be the best and cost effective option for business marketing. 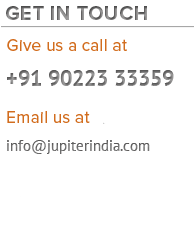 As a performance based Search Engine Optimization Company based in Thane Mumbai India, we have got professional SEO experts, who are committed to bring best results in search engines. Our services and cost effective and performance based. Our professionals at Jupiter Web Services located in Thane, Mumbai provide you with Social Media Optimization (SMO) Services which work as effectively as viral marketing. Social media optimization (SMO) has proved to be another better way to attract clients to your website and getting the site optimized better than Search Engine Optimization (SEO). It helps you to focus on driving traffic from various sources other than search engines, thus providing an improved search engine ranking. Another important feature of Social Media Optimization (SMO) is that this service is cheaper than the other SEO services. You can also lead to generation of one way links from high ranking sites. Therefore, it's great for your page optimization and would enable people to find these links while browsing these social websites. The more explanatory and informative is your review, the more possibility of people browsing through your link. © 2004 - 2018 Jupiter Infotech - Search Engine optimization SEO Company in Thane Mumbai, India. All Rights Reserved.